2 How does MediaHarmony work? MediaHarmony is an open source (GPL) VFS extension module for Samba that enables collaborative editing of media files using Avid Media Composer on shared storage (CIFS/SMB). In QuantaStor you can activate this feature on any given network share by checking the 'Enable Media Harmony' box when you create or modify a network share. Once enabled the module ensures that multiple editors do not collide by ensuring that each user of the network share gets their own dedicated copy of the Avid Media Composer metadata files. Inside the project subdirectory you'll have your mxf files and you'll also find two special files in there that Avid Media Composer creates called 'msmMMOB.mdb' and 'msmFMID.pmr'. Side note: Typically Avid will store the MXF and metadata files in a sub-directory called "1" (eg: X:\Avid MediaFiles\MXF\1\ ) but you can rename the directory whatever integer number you like. MediaHarmony is maintaining separate copies for Bruce who's logged in via 192.168.0.137 and Mary who's logged in via IP address 192.168.0.115. These metadata files ending in pmr and mdb are not designed for concurrent use by multiple editors so MediaHarmony's ability to maintain per-user copies of these Avid metadata files acts as a work-around. All the other files in the share are handled normally by Samba and are ignored by the MediaHarmony module. 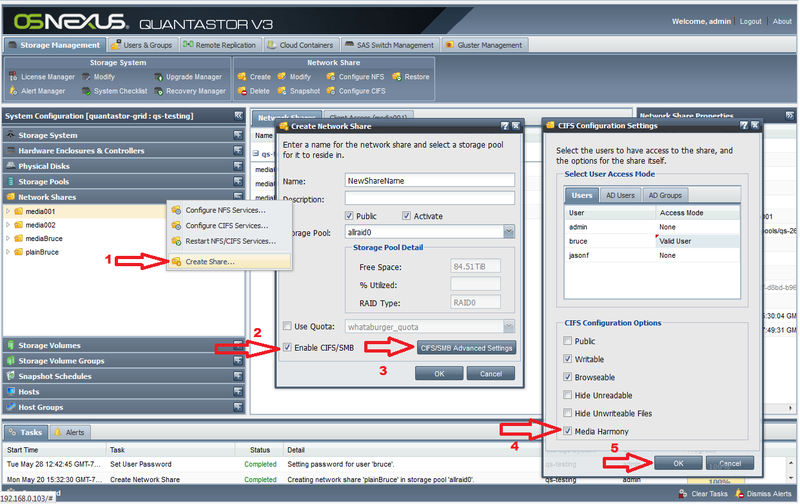 The following screenshot outlines the procedure for creating a new network share with the MediaHarmony feature enabled. You start by right clicking on the section marked 'Network Shares' and then you create a new network share with CIFS enabled and the 'Media Harmony' option checked. If you have already created a network share you can right-click on it and choose 'Modify Share...' to enable MediaHarmony on it. That's all there is to enabling the use of MediaHarmony for use with Avid. It is also possible to configure MediaHarmony for use with Avid on OS/X systems but it currently requires that you manually edit the /etc/samba/smb.conf file to enable it. For more information on that please contact us at support@osnexus.com. Type in “alldrives” (no quotes) and hit Enter. The console should respond that all drives are now active whereas only “true” drives were available. By itself Avid won't update when new mxf files are added to the bin but you can activate a script within QuantaStor to assist with this. You can also run 'avidupdate' at any time to trigger this update process. What this script does is updates the time-stamps on files in your MediaHarmony enabled shares. Avid will discover that the timestamps on the file(s) have changed and will in turn update itself by importing the new files from disk. To view the logs to see the activity from the avidupdate script just type 'avidlog' at the console and hit Ctrl-C when you're done viewing the log. In some instances we've used the 'Clear Bin Memory' option to clear the cache in Avid Media Composer which can help preemptively update the bin. 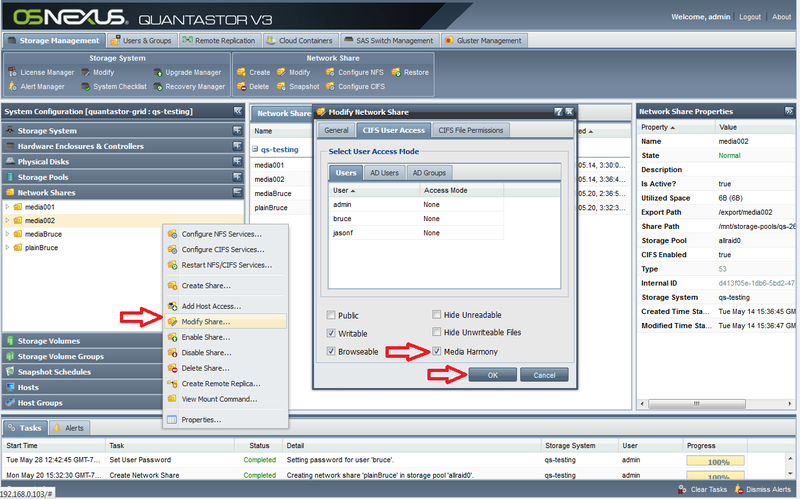 This step requires logging into your QuantaStor system at the console or via ssh. Once logged in you'll change directories to the network share directory for which you've enabled MediaHarmony. Next run the 'du' command like so to search for the metadata files which both contain 'msm' in their name. You can see here that the user 'bruce' is logged into this share via IP address 192.168.0.137 and that MediaHarmony has redirected his writes to the file 'msmFMID.pmr' to this unique file with the special suffix 'msmFMID.pmr_192.168.0.137_bruce'. If you don't see this suffix with the IP address and username in it then MediaHarmony is not active or you have your files under some directory other than 'Avid MediaFiles/MXF'. Note that MediaHarmony does not merge media files so you'll need to coordinate with the other artists and editors to avoid making changes to the exact same mxf file at the same time. After editing files there is a script you can use which will force Avid to refresh and discover newly edited files from other editors which have been stored in the shared MXF folder. This script simply modifies the time stamp on the mxf files to force rediscovery. MediaHarmony and several other Samba VFS modules were developed several years back and then revised and updated by Andrew K. for Samba 3 and Samba 4 and released under the GPL license. This page was last modified on 21 March 2019, at 11:14. This page has been accessed 118,245 times.